What’s happening at ALTA Fitness is about keeping you up to date with the events or activities we are doing each month at our Canterbury Studio along with the usual Personal Training, Small Group Sessions, Rehab and coaching. Our activities are about growing our community and hopefully creating more awareness in the world of health and fitness be it around Personal Training, Nutrition, doing something for a good cause or simply something fun. They will vary throughout the year and sometimes we might decide on something spur of the moment too, so watch this space and keep up with ‘What is happening this Month at ALTA Fitness’! We hope that you will join us in many of our activities. Earth Hour 30th March 8.30pm 2019 – The fight for our planet is on and that’s why we join Earth Hour. We live in one of the most beautiful and luckiest countries in the world but we’re facing massive threats to our biodiversity due to climate change, so it is our symbolic gesture to show the need for stronger climate action. Are you ready to join the movement, Australia? We are, we’ve registered and if you’d like to join us the link is below. Review Us & Win – April. We love what we do and so do our clients so by reviewing us helps us to help more people to be fitter, healthier and happier. And as a thank you we will draw a winner from anyone who reviews us on Google Business, Facebook, Instagram or Aussie Web with a $100 gift voucher to The Hills Wine Bar in Surrey Hills. 33% off an extra session. This offer was so successful last month that we decided to kick off the year with another! 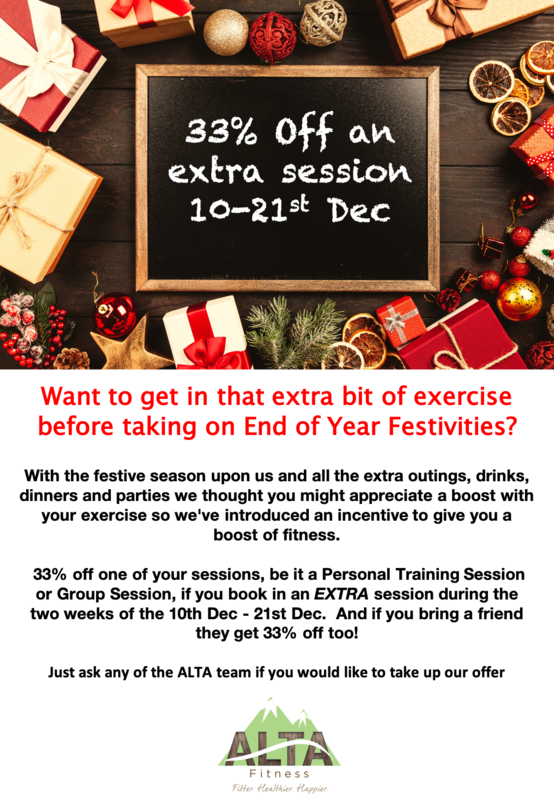 33% off one of your sessions, be it a Personal Training Session or Group Session, if you book in an EXTRA session during the two weeks of the 10th Dec – 21st Dec. And if you bring a friend they get 33% off too! Just ask any of the ALTA team or call us on 0410 544 759 if you would like to take up our offer. Couples Month. We’ve extended Couples Week to Couples Month this year as we love, love, love sharing the love of fitness with our loved ones. And with love in the air during February and what better way to let your loved one know that you want to share the joy of exercise and fitness so that you may have a long and healthy life together! Commencing 1st February if you bring your husband/wife/life partner they come along for free! Want to get in that extra bit of exercise before taking on End of Year Festivities? With the festive season upon us and all the extra outings, drinks, dinners and parties we thought you might appreciate a boost with your exercise so we’ve introduced an incentive to give you a boost of fitness. 33% off one of your sessions, be it a Personal Training Session or Group Session, if you book in an EXTRA session during the two weeks of the 10th Dec – 21st Dec. And if you bring a friend they get 33% off too! November is Assessment Month. It’s that time again when we do Assessments, as keeping track of your goals and achievements is, for many of us, the reason we come to get fit, be stronger or fix an injury in the first place! The team will be talking to all our clients about setting up a time to do assessments. This is a vital step in your fitness program and it gives us the opportunity to celebrate your achievements and make any adjustments moving forward. Bring a Friend Week 3rd to 8th Dec. Bring a friend, family or work colleague this week your session and you both train for free! And the best part is that they get to experience the joy you get from being fitter and see the difference it makes to you. Community Matters. This is exciting for us. We will make 3 donations to local charities, not for profits or even sporting teams: $300; $125; and $75 and we’d like to do this on the 1st October this year! We have tied in your commitment to training and your introduction of new clients to helping us select which charities receive these donations. Nomination Time: Monday 16th July to Thursday 2nd August– You can nominate a charity, not for profit or sporting club that you think could be helped with a donation. We will have a clip board up on our notice board for you to write down your nominations. The more your train the more nominations you can pop down! Selecting Your Top 3: Monday 6th August to Thursday 24th August– Over this period we will have the full list of nominations and every time you work out with us, you can vote. We are aiming to select your top 3 charities that you’d like to support! Again the more you train over that 3 week period the more votes you can place! Time To Really Help: Monday 27th August to Thursday 20th September– We will have 3 jars with the top 3 charities noted and for every session you attend we will give you a token to pop into the jar of the charity that you would most like to see our donation go to and at the end of 4 weeks the jar with the most tokens will receive the $300, 2nd $125, 3rd $75. The more you train over this four week period, the more tokens, the more votes you can place! Added Bonus’: We will DOUBLE the donations, if we reach 100 clients by the 20th September AND 2. from Monday 16th July, you can nominate a friend for a free workout with JC, Lisa, Johnny or myself – depending on availability. Should your friend become a client: you receive ONE free session! Plus you’ll get a bonus vote! And more importantly you’ll have helped a friend get fitter, healthier and happier. Living Longer Living Stronger. As we are very committed to our community we are introducing new classes for the over 50+. Commencing with Thursday 10am 30min sessions. LLLS has been around for many years and we saw it as a good fit for our business as their focus is to help our older community to get fitter utilising Strength Training using weights (dumbbells, barbells, machines or your own bodyweight) to increase muscle strength and endurance. In fact it is what we do with our Senior Ladies Classes so we hope to see more of our local community coming into ALTA Fitness. If you know someone who would be interested, forward this on to them or let us know if they would like us to contact them. Mobility & Falls Prevention Workshop Tues 5th June 12.30pm. At this workshop we will talk about Osteopenia, Balance and Coordination and what can affect them, at home and on the go tips and the benefits of resistance and strength training. Along with Dr Emma Jordan who will talk about how balance and stability and the impact this can have on our health overall. We would love to see you there and bring along your husband/wife/neighbours for this free event followed by light refreshments. Surrey Panthers Football Club Wed 13th June 7.30pm. At this free workshop Jean-Claude from ALTA Fitness whose daughter plays in the Girls U13, along with Dr Emma Jordan (Osteopath), from the Family Wellness Group, will be holding an interactive workshop focussed around preventing injuries for the game of AFL. It is relevant for all levels but never more so than with the introduction of female teams. As children grow, it’s important to promote body awareness and healthy training habits to minimise the risk of injurythat may occur with a fast paced, endurance sport such as AFL. All Coaches and parents, are welcome at the Surrey Park Panthers Club Rooms, Cnr Canterbury Rd & Elgar Rd, Surrey Hills. Any Queries please call Linda on 0410 544 759. Shopping Trip to Apples & Sage Organic Food Store July. Interested in a shopping trip with a difference, learn more about organic foods, whats on offer and how to eat healthier. Apples & Sage have kindly offered our clients the chance to have someone walk around their store with us. It will be an opportunity to learn more about the benefits of organic foods to us and the earth, ask questions, get advice and more. Commonwealth Games Activities – With the Commonwealth Games starting 4th April we will be having a rowing competition at our studio similar to our ski erg competition which was so much fun earlier this year. The distance is 1000 meters and there will be prizes to be won! Coaching Clinic Skiing & XC commences May 10th – Do you want to be super fit and awesome for skiing this season – it doesn’t matter your age or ability this clinic is about getting everyone in to better shape to ski the season. A little story, one day I was on a ski lift with the head Ski coach for Falls Creek Ski Academy and he was stressing the importance of Strength & Conditioning exercise before hitting the slopes – so here it is ALTA Fitness with Jean-Claude Legras, one of the S&C coach’s for the Australian Ski team is going to take a 10 week program to get you fitter for the season be it down hill, snow boarding or cross country skiing – book now! Couples Week. Love is in the air during February and what better way to let your loved one know that you want to share the joy of exercise and fitness so that you may have a long and healthy life together! Week commencing 12th February if you bring your husband/wife/life partner you both come along for free! Review Us & Win. We love what we do and so do our clients so by reviewing us helps us to help more people to be fitter, healthier and happier. And to do this it helps us to have reviews and as a thank you to anyone who reviews us on Google Business, Facebook, Instagram or Aussie Web we are giving away a $100 gift voucher to A Girl and A Goat restaurant in Surrey Hills. Holiday Survival Guide. We started this tradition last year with a guide to helping to keep you fit and healthy during the Holiday Season. With some hints and tips to get you through the End of Year parties, Christmas and New Year where lots of catching up with work mates, friends and family means lots of eating and drinking not always the healthiest of foods – but let’s face it we can enjoy a bit of indulging now and then! Refer a Friend in Jan. What better way to start the year than by referring a friend who could do with some help to be fitter and stronger! Join them in a session together and get 50% off plus if they join up for 3 months or more you get $100 cash as a sincere thank you for helping someone to be fitter, healthier and happier. Bring a Friend Week 9th – 14th Oct. Bring a friend, family or work colleague this week your session and you both train for free! And the best part is that they get to experience the joy you get from being fitter and see the difference it makes to you. Spring Racing Carnival Offer – Get Fit and Fabulous – 4 weeks of Unlimited Group Session starting 9th Oct $199. Melbourne’s Spring Carnival Racing is a time in Melbourne where we all dress up in our finest for the race season. So why not feel fabulous in your outfits this year as well as being fitter to last the whole day through – be prepared, start now. It’s an ideal way to kick off your summer fitness too and for those who sign up we are including nutritional tips and joining up with the team at Aesthetic Skin Design who know all about keeping us looking our best – men included! Couples Week Nov – 13th – 18th Nov. It can be so motivating to work out with a friend and we have found that many of our clients really enjoy working out with their husbands, wives or partners. And it really helps that when you are exercising together the healthy effects flow into other parts of relationships such as eating well together and looking after all of your health needs. Mission 100. What can we do to help grow our community and help extend this to our local community is what we asked ourselves – and we came up with Mission 100. It’s not just about us building a business it’s about what we can do and we are good at getting people fitter and healthier and this is very gratifying for us. So we came up with the idea that if we can build our business to 100 clients that we help to get fitter and healthier then we would donate $1000 towards our local community. And as a show of our commitment we have already started this with donating $440 to the Victorian Police Street Smart initiative that aims to educate our youth on the dangers of drug and alcohol abuse, depression, bullying, road safety and lifestyle choices. We have a few other initiatives we’d like to support such as Rotary & we’d really appreciate it if you know someone who could do with our help to let them know about us and it helps us to reach our goal of 100 clients so we can deliver on our promise to our community. November is Assessment Month. We do 2 Assessment months a year May and November. We also do many more depending on our clients goals some do them every 8 to 12 weeks! The team will be talking to all our clients about setting up a time to do your assessment. This is a vital step in your fitness program and it gives us the opportunity to celebrate your achievements and make any adjustments moving forward. Do past injuries stop you from exercising or do you just suffer from aches and pains day to day. Did you know that exercising can reduce many aches and pains. Many people are not moving well, they don’t have good movement patterns hence they don’t have good mobility, stability & flexibility in their muscles and joints which can cause these aches and pains. If you’d like to know more about what we do or hear proof from our clients that once just suffered through the day to now being fitter, stronger and painless, contact us as we’d love to help you. Open Day Saturday 24th June! – This June is actually our 1st Birthday Month! We are excited to celebrate by having an Open Day on Saturday the 24th June starting at 10pm with lots of free sessions and spot prizes. Come along, bring a friend join us to exercise or learn something new in fitness and health. All are welcome and if you are interested to know more details give us a call or drop in for a brochure on all the activities of the day. May is Assessment Month – We do 2 Assessment months a year May and November. We also do many more depending on our clients goals some do them every 8 to 12 weeks! The team will be talking to all our clients about setting up a time to do your assessment. This is a vital step in your fitness program and it gives us the opportunity to celebrate your achievements and make any adjustments moving forward. Mindful May – We are going to focus on the benefits of mindfulness “Mindfulness is the basic human ability to be fully present, aware of where we are and what we’re doing, and not overly reactive or overwhelmed by what’s going on around us”* We believe that being mindful has great benefits when you are wanting the most out of life and when you are with us at the studio. In fact you may not be aware that you are in that state when you are training with us. Look out for more info to come. Review Us and Win – We are doing the review us and win promotion again this month with a chance to win a $100 voucher to Squisito in Maling Road, Canterbury for a delicious lunch or dinner. We’d really appreciate a few words and a rating as it helps us to grow our business and keep investing to make ALTA Fitness even better. It’s simple to enter, review us on Google, True Local, Facebook or Aussie Web. The winner will be drawn randomly and if you happen to have reviewed us on 2 or more we will add a further $50 to your voucher! We love our clients and without your support we’d not be here – sincerely we thank you. Clean Eating Month – We’ll be giving tips on clean eating this month and we also have a program from Arbonne should you really like a boost in getting started. The premise behind the 30 Day Clean Eating program is about learning more about the foods we eat, eating cleaner and detoxing our bodies. It is not a diet! If you don’t want to give up coffee or alcohol – don’t! What the program does offer is 4 weeks of recipes, with a shopping list, a closed Facebook page that has some quick tips and education pieces and a range of products to replace one meal a day with a nutritious smoothie. It is suitable of the whole family. Sign up is by Tuesday 28th Feb and starts 6th March. For more information contact me as I’ll be doing it with you so you are not alone. Tiny Habits – This program is by Dr. Fogg who is fascinated with how habits form. He believes that to design new habits for ourselves or for others, the best starting point is to use a method that he calls “Tiny Habits.” We have done this program with amazing results and we’d like to share it with you to change some not so good habits into incredibly good ones or creating brand new habits to maybe help reach a goal or just to make your life easier and happier. An example is getting you to floss your teeth each day, or getting up to that morning group session, or texting your mum each day or ,or ,or…It is your choice what habit you want to change. Wehope you will join us in this quest to form or change a habit. February is Couple Month – Your welcome to bring along your husband, wife, girlfriend, boyfriend or partner for 1 free session a week with you for the month of February. Let us know if you’d like to take up this offer and we can give you a little card to encourage them along with you. febfast – At ALTA Fitness we care about people and it’s our aim to not only help people get fitter and healthier but happier so by getting involved in raising funds for febfast and further initiatives later in the year we hope that we can contribute to the wider community as well as our clients. For febfast JC and I have decided to give up coffee (& he says wine!) to raise money to help disadvantaged young Australians this year. If you’d like to join the ALTA Fitness team or assist by giving a donation click on the link at the bottom of this page and it will take you through to our fundraising web page. It would be great fun to do as a team and a good excuse to maybe kick a not so good habit or just get healthier along with us.